SASPAC v9.25 is now available to users. This is the first version of the software to query and interrogate data from a ‘live’ online source, in this case it’s the Neighbourhood Statistics Data Exchange (NDE) service. SASPAC’s new ‘Web Services Wizard’ allows users to search, browse and download any of the 300 datasets available from the NeSS website. This version is also compatible with Microsoft’s latest operating system: Windows 7. 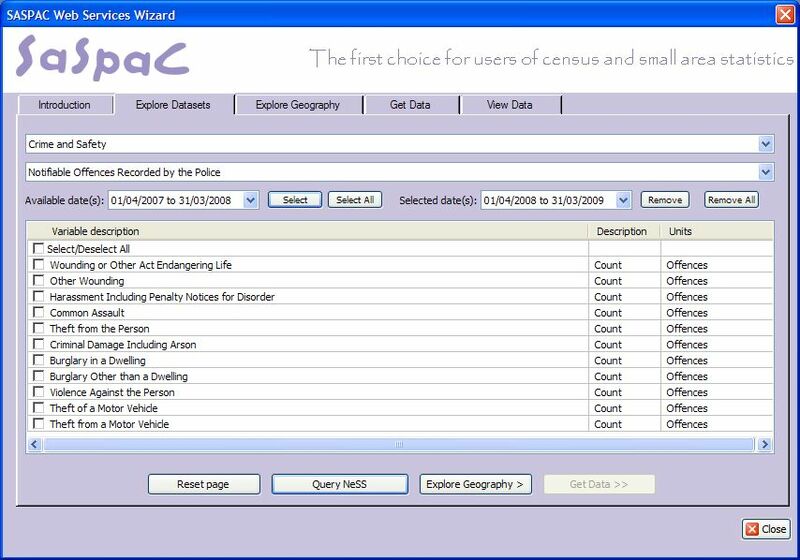 This is a ‘proof of concept’ development by the SASPAC team and is the first step towards a service that will ultimately deliver the 2011 Census and other datasets to users in the future. The helpdesk would like to hear your feedback on this application and any comments you may have on future developments. To upgrade from v9.00 (or interim updates v9.05, 9.06 or 9.07) you will need to download the update files (.zip file) and follow the instructions documented in the release-notes (.pdf file).